There's something about traditional Holi delicacies that makes us look forward to them every year. 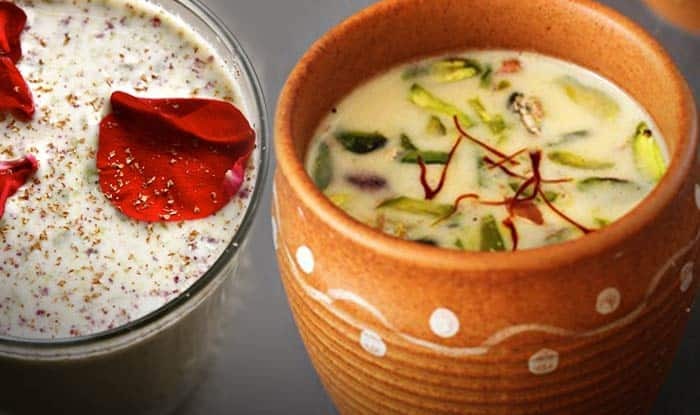 Try these healthy Holi recipes and get ready for compliments. If you are planning a house party this Holi, ensure that your guests are treated to delicious festive food. The best way to do that would be to cook traditional Holi delicacies at home instead of ordering them from outside. Try these healthy Holi recipes by Chef Avinash Kumar, Novotel Imagica Khopoli. Next, make wadas and deep-fry it until it turns golden in colour after that soak them in water for about 25- 30 minutes. Now remove excess water from the wadas by pressing it gently. 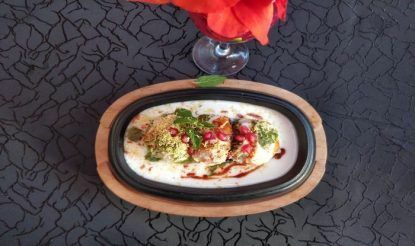 To make an individual portion of dahi bhalla, place dahi wada in a plate, add more curd if required, put green chutney, tamarind chutney and pomegranate arils. Sprinkle some red chilli powder, roasted cumin powder and fine chopped fresh coriander. Finally, garnish with fine sev and serve. Make a dough of refined flour, semolina, salt and soda; keep the dough for resting for about 15 minutes. Roll it and cut into circles and deep fry it or buy readymade puris from the market. Soak some tamarind, make pulp out of it, and mix it with the ginger, black salt and jaggery. Add water till you get the desired consistency. Grind mint leaves, coriander, green chilli, amchoor powder black salt and cumin powder and make a paste. Add water until you get the desired consistency. Make sprouts and Kabuli chana chat by mixing chaat masala and chopped onion and fresh coriander. 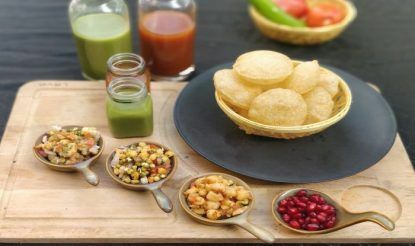 Assemble the pani poori, stuff it with the desired stuffing and pour pani in the poori and serve.